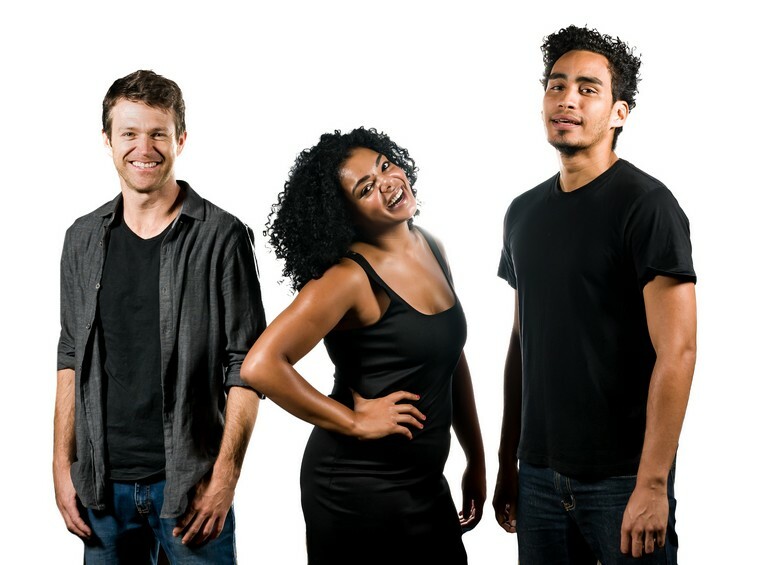 5 Alistair Moulton Black (Alan), Bianca Flanders (Liesl) & Ruben Engel (Jakes) new cast members in Aunty Merle, The Musical by Marcc Lottering. Popular Comedian Marc Lottering’s most beloved character, Aunty Merle Abrahams from Belgravia Road in Athlone, will be mincing back onto the stage in the musical-comedy Aunty Merle, The Musical, returning to the Baxter for the month of April. But it’s never smooth-sailing in the world of Musicals. Abigail’s twisted and corrupt ex, Denver Paulse (Loukmaan Adams), who holds a dodgy top job with the SABC, is determined to get her back. If not, he threatens to reveal a very dark secret which is bound to tear the lovers apart. And what of Merle’s son Carl (Roberto Kyle), who spends so many hours with his Varsity friend Siya (Sizwesandile Mnisi)? The boys are obsessed with Beyonce. Merle’s neighbour Soraya Samsodien (Carmen Maarman) certainly has some thoughts of her own around this. And then there is Lydia Majola (Tankiso Mamabolo) from Khayelitsha. She has been on a 20 year journey with Merle, employed as Merle’s Helper. But how can Mrs Majola focus on cleaning a house when she has just discovered that her husband is a Blesser? In addition, Mrs Majola’s feisty daughter Nambitha (Zandile Madliwa), fresh from Oxford University, has a venomous political apple to peel with Abigail. Joining Aunty Merle for the latest season are new cast members Alistair Moulton Black as Alan, engaged to Abigail; Bianca Flanders as Liezel, Abigail’s best friend; and Ruben Engel, as Alan’s best friend. Can Aunty Merle get everyone to live happily ever after, and still pull off the wedding of the year? Find out in this new season of the production scripted by Marc Lottering and Lara Foot, and also directed by the latter. Alistair Izobell serves as Musical Director and Grant van Ster is responsible for choreography. Lyrics are by Tarryn Lamb and Marc Lottering. Twenty-two original songs earned the cast standing ovations during the festive season. Aunty Merle The Musical received no fewer than four Fleur Du Cap Theatre Nominations, enjoyed a sell-out season last year and is back by public demand. * ‘Aunty Merle, The Musical’ will be showing from April 2 to 28. Performances are from Mondays to Fridays at 7.30pm, and Saturdays at 2pm and 7.30pm. Ticket prices range from R100 to R195: Monday & Tuesday R100/R160, Wednesday & Thursday R160, Friday & Saturday R195. Saturday Matinees (2pm) R135/R165. Book via www.webtickets.co.za, Pick ‘n Pay outlets and the Baxter by calling 021 685 7880. Age restriction PG 14.